The work being done by South Western All Terrain Trails will interest all B.C. ATVers. The sales and marketing co-ordinator for Canadian Snowmobile Adventures hit the ATV trails herself for the first time last summer. The Elkford ATV Club recently took on a large project : building a bridge crossing over the Elk River five kilometres north of Elkford. Wearing safety gear while riding is a no-brainer, and as technology evolves, so does the effectiveness of the equipment. 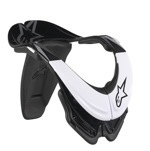 Alpinestars Inc. has developed a bionic neck support that is designed to mitigate severe neck injury. The BNS provides an alternative load path for energy that compresses the neck if a helmet is in contact with it when an accident occurs. While not guaranteed to prevent catastrophic neck injuries, the BNS—along with other safety gear—reduces the risk of such events. Get dirty with the 2011 Suzuki RM-Z450—the current model reigning over the FIM/AMA Supercross Championship. The RM-Z450 isn’t a brand new model, but the company has taken a formidable machine and tweaked it to improve performance. The 449 cc, four-stroke engine uses an electronic fuel-injected system and features a five-speed transmission. A reduced noise limit at 94 decibels without losing engine output is one of the new upgraded features on the 2011 models. This machine is ready to compete out on the track right on purchase and is a fierce competitor in the world of Supercross.